In Part 3 of this series on building a Progressive Web Application with Ionic and Stencil, we will be finally be getting into the practical side of things. We will generate a new application using the Ionic PWA Toolkit, and we will focus on creating the basic layout for our application. 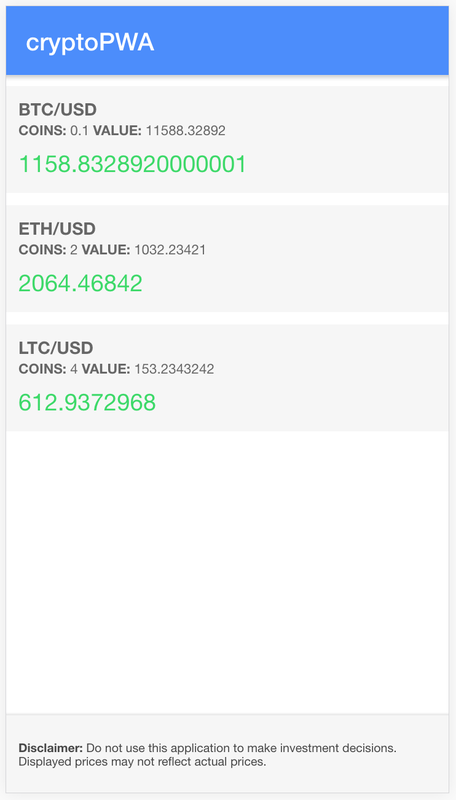 The application that we will be building is going to be a clone of the cryptoPWA application that I created a few weeks ago as a PWA using Ionic/Angular. This was also a multi-part tutorial series, you can check it out here if you like. Again, this series is tailored to people who are already familiar with Ionic/Angular. So, by recreating the same application it should serve as a good learning experience, as we will be able to make comparisons between the two. NOTE: In order to use Ionic with Stencil, we need to use Ionic 4. Ionic 4 provides all of its components as web components, unlike previous versions which are specifically Angular components. At the time of writing this, Ionic 4 has not officially been released and we will be relying on an early test release of Ionic 4. Keep in mind that some features in Ionic 4 may not be complete. To get started, we are going to generate a new Stencil project using the Ionic PWA Toolkit. If you haven’t read the previous tutorials, the PWA toolkit is basically just a starter Stencil project with a bunch of useful features for creating a PWA with Ionic included. You should now be able to see the default application in your browser, and anytime you make a change to the code it will be refreshed in the browser. This is more or less the same as an Angular component. The difference here is that the app-home.spec.ts unit test file is included by default (if you don’t know how to unit test you can just ignore this file for now), and the app-home.tsx file contains both the exported class and the template so we don’t have any .html file. Welcome to the Ionic PWA Toolkit. Check out our docs on <a href='https://stenciljs.com'>stenciljs.com</a> to get started. We’ve already discussed most of what is going on here in the previous tutorial. The render() function returns the template that will be displayed to the user. In this case, the Ionic web components are being used to create the page. This looks the same as any Ionic/Angular page you would normally create, except that we have to manually wrap it in the <ion-page> component. Notice the use of an array , where each top-level element is separated by a comma. Now, let’s modify the app-home component with our own template. We will be adding more as we go, but this is our basic layout. We just have a simple header and footer, with a (currently empty) list in the content area. Eventually, we want to loop through all of the cryptocurrency holdings we have set up and display them in the list. We also want to display a conditional message on the screen if the user currently does not have any holdings added. Before we do that, we need some data to work with. We aren’t going to worry about allowing users to add holdings through a form and then saving that data just yet, for now, we just want some dummy data to work with. We are going to set up some holdings data with @State because this data will change over time (and we need our template to update when it does). Adding interfaces/types isn’t necessary, but it does help improve the quality of your code – we can be sure now that the holdings array will definitely contain the type of data we are expecting. Although this data is static for now, we have something to work with for the rest of the tutorial. But on a more complex scale, this method doesn’t work all that well. If we have a big template with lots of conditions, we don’t want to supply 10 variations of the same template. We are going to use this method to conditionally render our message on the screen that should only display when no holdings are in the holdings array. We won’t see the effects of this whilst there is holdings in the holdings array, but if you temporarily comment them out you will be able to see the message displayed. NOTE: The message we added above uses a <stencil-route-link>. This won’t work yet as we haven’t set up that route – we will be getting to this in the next tutorial. By using a map, we are looping through each item in the array, and then returning the template we want for each of those items. Now let’s implement that in our application. Apart from the syntax difference to Ionic/Angular, we mostly just use the same approach. There isn’t really anything special about adding styles to the application, we just add them to the .scss file like we would in an Ionic/Angular application. To make our application look a little nicer, let’s add some styles. is a little more friendly (at least in my opinion). This is a good example of the bells and whistles a framework provides. A lot of the time, people will find these convenience features are going to be worth the extra weight of a framework like Angular (and obviously Angular has more to offer than just its structural directives). With Stencil, we are relying on just the default browser tech, which is super cool, but it always ends up depending on your own circumstances and goals to determine which approach suits better.